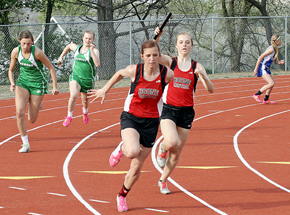 Although sandwiched between the season’s two most important track and field meets – the Mid-State Conference and B4 District – the annual Jerry Seier Memorial Quad featured its fair share of outstanding athletes and exciting competition Tuesday, May 6, at the Boone Central athletic complex in Albion. A pair of strong squads from Columbus Scotus won the team scoring in the girls and boys divisions, with Boone Central/Newman Grove runners-up ahead of Columbus Lakeview and Elkhorn Valley. More imperative than the team competition, however, was a final chance for athletes to fine-tune their performances for upcoming district competitions. In that regard, Cardinal Coach Kris Pestel was very happy with what she saw from her charges. “We were very pleased with how the kids performed in this meet. They had a total of 67 season-bests!” Pestel praised. “The conditioning we have been doing all season is starting to show. We even had a few kids we had to cut back in events due to some mild injuries. One Cardinal again displaying her skills was sophomore Sheldon Beierman, who swept top finishes in the 100 meter high hurdles and 300 meter hurdles. While she didn’t match the season-best 100 time she ran in last week’s Mid-State championships, Beierman did post a season and Albion News area-best clocking of 48.0 in the 300. Beierman was BC/NG’s only individual girls winner in the Seier meet, but the Cards did get a pair of relay wins, including a season and area-best 4:14.4 in the 4×400. Boone Central/Newman Grove also had eight event runners-up in girls’ competition – Olivia Slizoski, 100 highs (16.3) and 300 hurdles (49.3); Elissa Slizoski, high jump (4’6); Celine Dunlap, pole vault (8’6); Dana Pelster, 100 dash (13.1); Kendra Gonzalez, 1600 run (5:57.0); Bailey Reigle, 400 dash (1:07.9); Jade Gottier, 800 run (2:31.0); Christina Stopak, 3200 run (13:36.1). Three Cardinal boys scored event victories. Austin Zoucha continued a strong season in the shot put (49’4¼), Evan Struebing ran a new News area-best time (42.5) to win the 300 hurdles, and Andrew Rasmussen captured the 3200 meter run (10:56.8). The Boone Central/Newman Grove boys also had a number of runner-up efforts – Damian Backus, triple jump (40’3¾) and 200 dash (23.8); Kyle Kramer, high jump (5’8); Joe Brugger, pole vault (12’); Scott Ketteler, 110 highs (16.1); Rasmussen, 1600 run (4:55.0); Ethan Young, 400 dash (58.0). The Cardinals’ 4×400 meter relay team had a banner day, winning that event and lowering its area-best time (3:33.9).